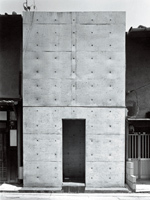 Essentially the debut work of the architect, this urban dwelling made throughout of exposed concrete replaced the middle unit of three row houses in a downtown district of Osaka. Ando dared to create in the middle of an already-small house a courtyard occupying a third of the site area and to propose a new lifestyle in coexistence with nature, even though he was working under severe programmatic constraints. This work is in every sense the starting point for Ando's architecture. This is a small work of religious architecture built in a residential district in an Osaka suburb. 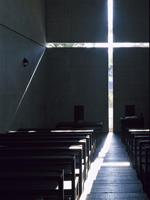 Having to work within an extremely tight budget, Ando reduced the architectural elements to a bare minimum and produced a highly symbolic space of worship with a simple box-shaped composition of concrete that has as its theme the phenomenon of light and shadow. Ten years after its completion, a new Sunday school that is in formal contrast to the church was added. 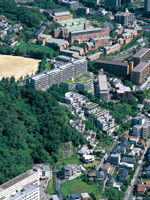 These are housing complexes, built in three phases since 1978 on sloping sites in Rokko, Kobe, and a fourth-phase medical welfare facility that is currently under construction. The projects are all for different developers and differ also in size. However, Ando's theme has always been to organize the buildings so as to make the best use of the topography and to create diverse living spaces. He has also tried to provide more substantial public spaces as the projects have grown in size. 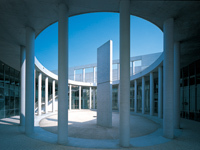 This is a "village" created in the vocabulary of contemporary architecture through Ando's power of imagination. This facility with a 200-person capacity hall was built on the Hongo campus of the University of Tokyo to commemorate the 130th anniversary of the university. The building was half buried in the ground out of respect for the historic environment of the campus and to retain the trees standing on the site. 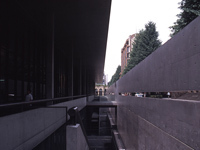 The result is a low-profile building in which half the building is composed of a stepped plaza that leads to the basement levels. The "thinking wall" created along a campus road is especially impressive. This new underground Shibuya station links the Tokyo Metro Fukutoshin Line and the Tokyu Toyoko Line. Ando proposed an egg-shaped station space in the image of a "hypogenous ship" inserted into the underground infrastructure like one box nested inside another. A void space connecting the concourse on the second basement level with the platforms on the fifth basement level is at the center of the egg. 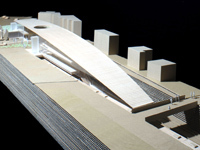 This dynamic spatial composition also serves as a device for naturally ventilating the underground station. 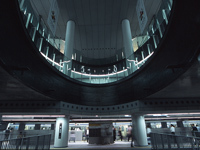 A project for functionally improving Tokyu Oimachi-Line Kaminoge Station, being undertaken in connection with the transformation of the station into a four-track facility. This project includes extension of the route and provision of barrier-free access. An ordinary road cuts across the station site, above the platforms. The idea of the proposal is to cover the various facilities of the station and bus stops located on both sides of the road with a single large roof. 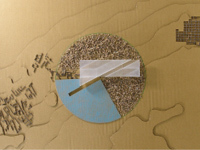 The objective is the rational consolidation of urban infrastructure through the integration of diverse transportation networks and the creation of a townscape around the station that will be the "face" presented to visitors by the district. The site is in Treviso, Italy. Benetton, the fashion-maker, has created a communication research center to provide support to young artists from around the world. The architect preserved and restored a seventeenth-century aristocratic villa set in the countryside. Most new building elements, together with a beautiful, geometrically-shaped sunken court, were placed below ground so as not to disturb the existing landscape. After the F. Pinault Foundation for Contemporary Art project on Seguin Island in Paris, France, was halted, Ando began this project in Venice, Italy, again with Francois Pinault. 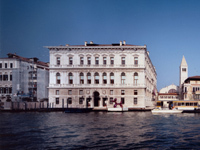 Palazzo Grassi, a neoclassicist palace built in the late eighteenth century close to Piazza San Marco, near the center of the Grand Canal, was converted into a state of the art space for contemporary art. 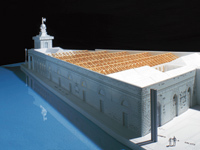 This is a project to convert Dogana di Mare (Maritime Customs), a state-owned fifteenth-century building of historic value located on the shore opposite the Piazza San Marco, into a museum of contemporary art. As with the Palazzo Grassi Renovation project, the question is how to produce spaces of a contemporary character while making full use of the building's potential and working under the severe legal constraints imposed to preserve historic structures in Venice. The site is on Saadiyat Island in Abu Dhabi, the capital of the United Arab Emirates (UAE). This is part of a large cultural development project in which Frank Gehry, Jean Nouvel and Zaha Hadid are also taking part. 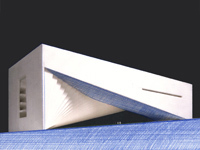 In response to the facility's program, which is to communicate the region's maritime culture, Ando has proposed a building with a bold form: a volume with a rectangular plan from which a shell-shaped void that suggests a wind-filled sail has been carved out. The site overlooking the Saar burial mounds is in a suburb of Manama, the capital of the island nation of Bahrain in the Arabian Gulf. The project is for a museum to exhibit valuable historical material on the Dilmun civilization, which flourished in 3000 B.C. In response to the powerful forms of the ancient graves, Ando has designed a building with a strong geometrical form possessing a triangular motif, like a wedge driven into the vast wasteland. This project is for a new building for the art, architecture and design school of the university, to be constructed on the campus in Monterrey, the second largest industrial city in Mexico. 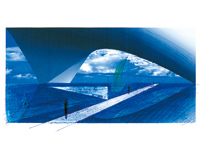 A gate-like design with an enormous pilotis space covered by a complex curved surface is being explored for the site, which is at the entrance of the large campus. A residential project of about 1500 square meters is also underway in Monterrey. COPYRIGHT (C) 2008 TOTO LTD. ALL RIGHTS RESERVED.